Old Bollywood poster for sale of the cult Hindi comedy Chashme Buddoor (1981) for sale. This is an actual surviving old Bollywood poster of the 1981 film considered one of the finest romantic comedy films ever made in Bollywood. Directed by Sai Paranjpye, Chashme Buddoor starred Farooq Sheikh, Deepti Naval, Rakesh Bedi, Ravi Baswani and Saeed Jaffrey in prominent roles. Printed and circulated a few years after the first release of the film (mid 1980s), this Chashme Buddoor movie poster was originally designed for publicity of the film but never ended up being used. This old Bollywood poster for sale was originally designed in hand painted oil on canvas format by an art studio in Delhi. The printed signature of Bollywood poster painter O.P. Bangali is seen on the bottom right hand corner of this Chashme Buddoor movie poster. 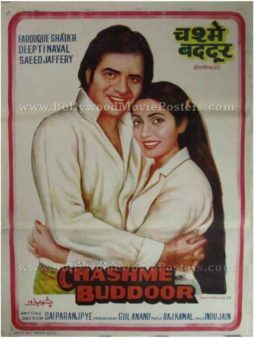 A simple but beautiful hand painted portrait of lead actors Farooq Sheikh and Deepti Naval is seen prominently in this Chashme Buddoor movie poster. The poster is set against a minimal plain white background with typography appearing at the bottom in red. Chashme Buddoor was a silver jubilee hit and is counted as a memorable film in the history of Indian cinema. The success of the film spawned two subsequent remakes in Malayalam and Hindi respectively. A couple of songs from the film,”Kahan Se Aaye Badra” and “Kali Ghori Dwar Khari” became instant hits due to their unique lyrics and classical style composition. 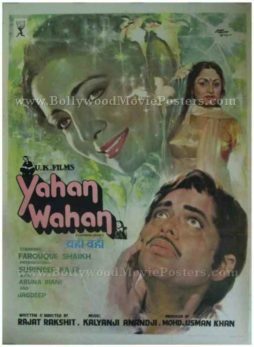 Original Bollywood movie poster for sale of the classic Hindi film Yahan Wahan (1984). This is an actual surviving original Bollywood film poster for sale of the 1984 Hindi film that starred Farooq Sheikh, Aruna Irani, Jagdeep and Surinder Kaur in lead roles. Printed and circulated during the initial release run of the film (somewhere in the early 1980s), this original Bollywood movie poster was designed for publicity of the film but never ended up being used. This old Bollywood poster was originally hand painted on canvas by a leading poster design studio in Bombay. The printed signature of Bollywood poster painter Ashok Sharma is seen on the top right hand corner of the poster. A stunning hand painted portrait of actress Surinder Kaur is seen on the top. Painted using soft hues, her portrait blends into the background of this original Bollywood film poster. A smaller hand drawn portrait of Aruna Irani appears alongside. 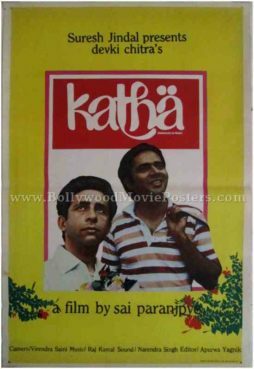 Another large hand painted portrait of actor Farooq Sheikh is seen at the bottom of this original Bollywood movie poster for sale. The title of the film features an interesting logo that uses black and white photos of the two stars pasted on the top and bottom.